A great article from the Canadian Horse Journal found its way to my inbox and I thought I would share. Do you turn out your horse? For how long? Would love to hear your thoughts! Limiting or eliminating turnout is common practice in the high performance equestrian world, usually in an attempt to avoid equine injuries that would be detrimental to performance goals. But does confinement to a stall or very small paddock cause more problems than it prevents? In nature, wild horses are herd-oriented and nomadic, spending up to 20 hours a day on the move, covering an average of 15 to 20 kilometres and grazing as they go. Despite thousands of years as a domesticated species, our horses have retained the same basic physiology, instincts, and social needs as their feral counterparts. Insofar as we are able, satisfying these basic needs is imperative for promoting physical, mental, and emotional equine health, and turnout is an important component to consider. Studies have demonstrated that horses confined to their stalls are more likely to develop health issues – such as respiratory problems, gastric or colonic ulcers, and impaction colic – that are associated with lack of movement and restricted grazing. Daily turnout, preferably for at least several hours, not only exposes your horse to the fresh air, exercise, and grazing habits that promote good respiratory and gastrointestinal health, but also helps build general fitness and stronger bones, muscles, and ligaments and tendons. 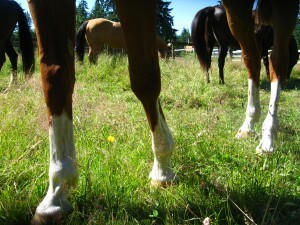 Additionally, the increased movement encouraged by turnout should improve a horse’s flexibility. Turning your horse out before riding stretches his muscles, which can minimize the risk of training-related injuries and enhance performance. Horses that receive daily turnout tend to be generally happier and less high strung, improving performance and making training and handling easier. Without the mental stimulation of being turned out and engaging with other horses, a horse will very quickly become bored and unhappy, and may develop stable vices such as chewing wood, weaving, or stall walking. Additionally, depressed mood in horses, as in people, often has a significant negative impact on performance. The social aspect of turnout with other horses is also of great benefit to a horse’s mental and emotional health. As herd animals, horses are extremely social by nature. Stabled horses often have limited opportunities to interact with other equines and this can have negative psychological implications. Turning your horse out with a single companion or a small group satisfies his instinctual need for interaction with other horses. Before you let your horse loose to begin reaping the physical, mental, and emotional benefits of turnout, make sure the turnout area is devoid of any potential horse hazards. Good horse turnout will have safe, well-maintained fencing, quality pasture without any toxic plants, good footing, a constant source of clean, fresh water, and shelter. As Natural Horsecare becomes more and more understood and more widely implemented it is important that we re-educate our children as well as adults in the new and yet age-old practice of natural horse care. My Natural Horses (by Anne Louise MacDonald) is a unique introduction to creating exceptionally healthy, happy horses. This full-color photo-illustrated book is the first to show young readers the principles of Natural Horse Care, taking an entirely positive approach by following two horses, Isabelle and Prince, through all four seasons of the year. Designed for ages seven and up, this book includes 150 exceptional photographs to delight everyone from the child who dreams of ponies to the active equine owner. Larger text allows younger readers to get a basic understanding of Natural Horse Care, while smaller text gives more details to entertain and inform an older audience. My Natural Horses is a joy just to look through, and an eye opener to an option in horse care that many horse people know little about. Here is a Video Preview of Anne Louise’s book. Anne lives in Eastern Canada. Some grasses are more problematic than others, and this can vary greatly. “There are many species that have a wide variance in sugar levels (under the same weather conditions and time of day),” says Ralston. 2.Being sure not to overgrazing and to practice good pasture management. Understanding how grass grows and how horses use sugars in grass and hay can help you better manage your equine charges. Grass is grass, right? Wrong! That lovely green pasture you’ve diligently watered and kept weed-free can be like Jekyll and Hyde. If your horse is at risk for grass founder or has a low tolerance for high levels of sugar, a pasture that might be perfect feed in the morning can be his biggest enemy in the afternoon.